Michael Dube is a versatile and savvy litigator whose practice is presently focused on complex commercial litigation and insurance law. Mr. Dube is an honors graduate of Rutgers College (1999) and Rutgers School of Law-Camden (2002). From September 2002 through August 2003, he served as an appellate law clerk to the Honorable Naomi G. Eichen, J.A.D. Mr. Dube joined Sherman Silverstein in September 2003, representing parties in diverse areas such as personal injury, products liability, medical malpractice, and clinical trials litigation; first party insurance coverage disputes; antitrust matters; sports law matters; complex commercial litigation; copyright and trademark; and criminal law. In 2006, after just a few years of practice, he was recognized as a Rising Star and has been included on that list on a number of subsequent occasions. In 2008, Mr. Dube relocated with family to Pittsburgh, Pennsylvania and began working for a large law firm, where he represented plaintiffs in FINRA arbitrations (serving as second chair for a client who received the second-highest single-claimant award in FINRA history, $12,000,000). He also defended physicians in sophisticated medical professional liability matters, insurers in insurance coverage matters, and "dram shops" in high-exposure liquor liability litigation. Mr. Dube rejoined Sherman Silverstein as of counsel in July 2011 and is thrilled to be back at the law firm at which he started his career. 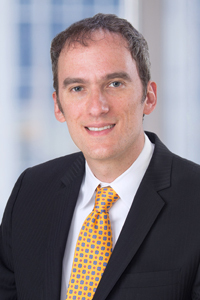 Since re-joining, Mr. Dube served as co-counsel to a plaintiff in a complex commercial arbitration that was awarded nearly $12,000,000, as well as intellectual property rights worth many millions more, and has successfully represented numerous plaintiffs and defendants in high-stakes matters and complex commercial litigation disputes. Mr. Dube has substantial expertise and experience in appellate practice with a focus on written advocacy before appellate courts. He has successfully represented clients in the Appellate Division of the New Jersey Superior Court, the Pennsylvania Superior Court, the Pennsylvania Supreme Court, and various federal appellate courts, including the Ninth Circuit Court of Appeals. Drawing on his experience practicing sports law, since 2015, Mr. Dube has served as an adjunct professor of law, teaching Amateur Sports Law, moderating and appearing on symposia panels involving sports law topics, and coaching law students in sports law-related competitions. Mr. Dube has also lectured to various physicians’ groups and Institutional Review Boards on issues involving informed consent litigation. Mr. Dube has been quoted in The Los Angeles Times, The Kentucky Herald-Leader, The Thoroughbred Times, and The New York Times, among other publications, and has appeared on various television and radio programs and served as a consultant for various media in connection with sports-law issues such as the Deflategate controversy, and Title IX. Mr. Dube lives with his wife, who is a history professor, and their young son. Since 2000, Mr. Dube has been a songwriter member of the American Society of Composers, Authors, and Publishers (ASCAP), and has composed music and lyrics for approximately 250 songs.